How To Distress Furniture With Vinegar. This technique of how to distress furniture with vinegar was discovered strictly by accident. I just finished painting a piece of furniture, I grabbed what I thought was water to wipe off a mistake I made while painting, then I noticed how easily my piece got a distressed look! Ah, you know me, always taking the photo of the before as I am about to start my painting. I don’t have to explain how I painted this because you all know how to do that right? I just cleaned this piece off with a damp rag and started painting. This table took two coats of paint, the first coat was just a little streaky. After painting this piece I started to distress it using vinegar mixture technique. This technique is super easy to do and one of my favorite ways to distress furniture. I love how authentic this piece looks. It really looks chippy and worn, as though it’s aged naturally. This is why I love this technique. 1). You don’t have dust flying everywhere, and with vintage furniture that could have lead inside the varnish or paint which is toxic. 2). I love the look of my pieces after I distress using the rag and vinegar method. It looks more authentic and you don’t have the scratches and scrapes you get when you use a sanding block. You know I LOVE my original painted pieces, table but this is a great alternative if you cannot find a piece you are looking for. I bet you are surprised I didn’t choose pink or white. Well, I really love this color, it’s a beautiful minty green! Next time you paint with a chalk based paint I challenge you to try this method. Thanks for the intro to this method…I will be sure to try it out. The little table is super pretty after her makeover. Is it a special type of paint, or would any water-based paint work (i.e acrylic)? How do you use the vinegar? Just plain? While paint is wet? I love that color and I love the distressed look. I have never distressed with vinegar–I have never even heard of that! I am going to try this for sure! I did not either Sandy until I discovered it by accident.Isn’t it funny how you can discover something purely by accident. How much water and how much vinegar? Sounds like a great solution. Oh yes, white vinegar? Yes white distilled vinegar, I use half water half vinegar in a spray bottle Flynn. I used to faux paint (when that was in) and used white vinegar to clean any accidental dried paint off basebords. Works fantastic, non diluted on a rag. Great tutorial I’m going to try this technique for sure. love this piece what ratio vingar to water did u use?? Honestly Brenda I don’t measure.My water bottle size is 24 ounces so I would say half vinegar and half water.I also use this same mixture to wipe down my counters and clean my bathrooms,wash my windows etc. I had no idea about this vinegar and water technique, Anne! How cool is this????! I love that it’s so much neater and cleaner, and really looks so naturally vintage. Thank you so much for sharing this! Definitely going to use your technique on my next painted project! This table is so pretty! I would like to try this but was wondering if you sprayed only the area’s you wanted to distress or did you spray the whole table and then ‘hit’ theses areas? And does the Vinegar/water solution leave ‘water marks’ on the chalk paint when it dries? Hi Lisa I sprayed the area’s I wanted distressed.I did not spray the whole table at once.So just a little section at a time.No I do not get water marks on the pieces that I have used this technique.But if you want to wax make sure to let this fully dry before waxing. You can see from the photos,no water marks are on this piece. Anne, that is just beautiful. I never heard of using vinegar to distress chalk paint! I thought I heard everything. Thanks! beautiful table, anne! thanks for sharing this technique–less sanding is always great! This is a great idea Anne. So clever and so much nicer than dust flying everywhere with sanding. Thanks for sharing this. Yes it is Kris,your welcome! Thank you Judy, I mix half water and half distilled vinegar in a water bottle. Hi Anne! Thanks for this great tip…i’m not a fan of sanding and all that dust! I was just wondering if you could use this method if you have already waxed? Hi Tammy I don’t think this would work on furniture that has been waxed.This is for furniture that has been painted and not waxed. Cool! I love the idea of using vinegar to distress – and I can see why it would work so good – we use vinegar to clean a lot of things so it makes sense that it would make distressing easier. I love the color of the paint too. Anne, what a beautiful table! I never heard of distressing furniture with vinegar! Great idea!!! I have several projects for the New Year… thanks for this great tip! Merry Christmas! So pretty-love the color and the technique-I will try it! I do the same thing with just water but will try it now with vinegar too! Great style and design love it! Great tip Anne! I would have never thought to distress painted furniture with vinegar but it makes perfect sense. I’ve used it with mirror finish spray paint to create faux mercury glass, so it probably would work for just about any paint. And no sanding dust! Definitely going to try this on my next painted furniture project! Thanks so much Angie!Yes I love the fact that you don’t get dust as you would with a sanding block and you are not using any chemical to do this either.Just good old fashioned vinegar. Awesome! Can’t wait to try this on my next project. Have you tried this technique on regular latex paint/non chalk paint and if so did it work as well? No Tiffany I have not tried this on regular latex paint.I have only tried this on chalk based paint.I really don’t think Vinegar is going to cut through latex paint.The reason this works is because of the plaster that is added to latex to make chalk based paint.You can all distress chalk based paint with water,but this makes the process much quicker and easier. Anne, I am currently redecorating a cottage style bungalow and in the beginning of painting projects. I use ASCP and love it. The vinegar method will make the projects so much easier than sanding. I am doing every piece of furniture I have as well as refrigerator, freezer, washer, dryer, an old dresser as an island in the kitchen. I’m so glad I found your blog, I will keep checking back for more tips. Thanks. Sounds like you will be very busy Sandy! I am getting ready to start a few projects myself! Anne, what is the advantage of distressing with vinegar over distressing with water alone? Hi Paula, Using vinegar makes this process much easier and quicker.I think it’s because of the acidity in vinegar,it breaks the paint down quicker than just using water alone. Thank you Cherie,yes the paint was completely dry before I distressed with the vinegar spray. Thank you. Can’t wait try it! I discovered something similar a few months ago with alcohol. As time went by, I tried plain water. It worked as well. Love using chalk paint! Yes Shirley water works great too, but I found using vinegar makes the process much quicker and it also gives my pieces a more authentic vintage look. Although I have not tried it yet, I’ve been told that you can distress with baby wipes as well. Either way, I’m glad I found your blog. Can’t wait to try this when the weather is a bit better! Gorgeous piece by the way! Thanks so much Amy! Oh I have not heard about using baby wipes that is another great option if you don’t like the smell of vinegar. Hi Anne, so glad I found your site….love your home and décor ideas. I have a question, and hope you can help. I have a beautiful old door…..original paint….what’s left of it. It is quite bumpy….kind of like alligator skin….and wondered if I should scrape it and chalk paint it……or is there another way to clean it up? Sandy your door sounds lovely! If it’s dirty use caution and gently wipe it off with an old rag, soap and water.After it’s dry use a spray on clear varnish.If after you clean it, you decide it’s still too dirty to leave as it is, then I would lightly paint a coat or two of paint.I painted over a door that has amazing patina.It’s the one that I have in my dining room.You can still see a cool patina showing through even though I painted over it. Glad to have this new distressing technique in my furniture painting arsenal! Beautiful color! Thanks so much! Yes it’s one of my new favorite colors! Pinning for future reference! Thanks for the great tip! Wow, great tip! I agree–the distressing is absolutely perfect with your technique! Hi Anne! I’m so excited to try this method! It’s gorgeous. I have one question. I know you said this would not work to remove regular latex paint so if I wanted to paint a different shade of latex paint under the chalk paint the vinegar and water should only remove the chalk paint, leaving the first coat of latex paint exposed, right? Thanks and fabulous job! Yes Brittany you should be able to use this method if your top coat of paint is chalk paint. Thanks so much! Yes Mary Anne you can use this technique with ASCP. Really with any chalk type paint.Yes you can still seal your furniture as you normally do either with wax or a general finish.I prefer wax one because it has a nice sheen, and two the wax that I use has very little odor if any. Love your paint job on your cute little table! Thanks for sharing this great technique for distressing! Love the color of the paint…where can I buy it? Thanks so much Melanie! 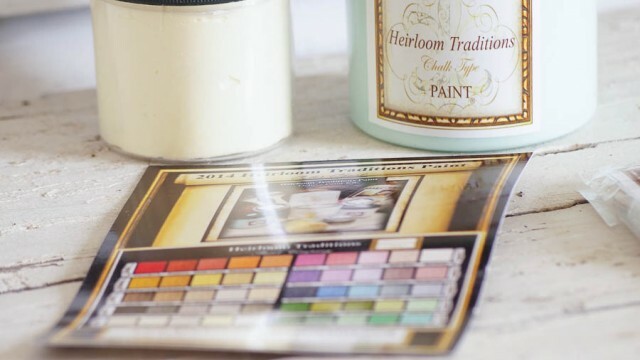 You can purchase that paint here on my site.Just click on the box left of my page that says Heirloom traditions paint.The color is Aqueduct. The distressing looks fabulous. Have to try this. Thank you. Thank you for sharing this great tip Anne. I already have my vinegar/water mixed and ready to go. I do have a question about the wax. Does the White Lime leave a bit of white on the piece? I have seen other lime or white waxes and I am curious. Thanks for your reply in advance. Have fun creating Eloise! Yes the white lime will leave a little white on your piece.It highlights all the imperfections on a piece.It really is a pretty effect. Thank you. I am looking forward to trying a couple of the colored waxes in that line and the paints. Your welcome Eloise! Have fun creating! I add plaster of paris to latex paint and make my own chalk paint. Works great. I have also stretched paint this way. What a beautiful piece. The minty color is divine. And, I can’t wait to try the vinegar method of distressing. I am working on a vintage buffet right now and am just about to the distressing stage. So glad I stumbled across your tutorial when I did! I’m sharing this on my Once Upon a Firefly FB page. Thanks so much Ann! Sounds like you are working on a beautiful piece! I love that color you used! Like you, I’m all for wet distressing for my pieces. It’s so much cleaner:) Thanks for sharing your new paint trial too:) Pinning! Love the piece and the color! I am working on some pieces now and I will be trying out the vinegar distressing technique today! Pinning too!! Emma to finish your piece after using the vinegar technique and after it’s dry, I used a soft furniture wax.For painting I use a purdy paint brush.For waxing I use …. a wax brush 🙂 . will the vinegar work on pieces that have been painted for many years or just newly painted pieces? PJ just on newly painted pieces, that have been painted using chalk paint or chalk type paint. I’m so sorry if you’ve already answered this. I did look and didn’t see this question but who knows:) Have you ever used the vinegar method on any surface other than wood? I paint a lot of jars and have a problem with my arm now, so sanding is getting to be a problem. Would a light mist of vinegar work on these too, in your opinion? I would think it would work Suzanne! Great question! I just started painting glass jars, so I will give this a try and I will let you know. But I don’t see why this would not work. Beautiful! Will definitely try and I’m pinning. This piece is GORGEOUS! I love this color and would like to incorporate more of it in my home. I have a table that was the brown wood similar to yours. I painted it a light gray…I have a gray and a teal chalk paint..so if I paint over the table as is with the chalk paint and use the vinegar mixture over top will that allow the original wood to show through? Thanks so much! Hi Anne…sorry to bother you again…but did you see my question above? Thanks so much! Yes if you are using chalk paint or chalk type paint and you are painting over a piece, and use the vinegar water method you will see the color underneath. Even if you are adding two colors, you should be able to distress it down to the original wood. Love, love, love this piece. I can’t wait to try this on some pieces I am starting to work on. Thanks for sharing. Thanks so much Elisa! Your welcome, have fun! On your table, you only did one coat of aquaduct paint, then distressed it with vinegar/water solution once dry, and used no wax–correct? It looks so cool and seems almost too simple to be true! Thanks for sharing your technique. Hi Sally yes one coat of aquaduct paint and distressed it. I did use wax once the table was dried and cured from being distressed. Hi! So I just have a questions, and I apologize if you already answered it. Can you prime before you paint and still do this vinegar method? I tried it and it did not work for me. I painted one coat of ASCP french linen and 2 coats of old white over that and it will not budge w the vinegar solution. Do u hv to let it sit for awhile then wipe? Do you have any tips on how to decide where to use the vinegar and where not to and will this work with spray paints? Kristy this technique is for chalk paint or chalk type paint as in Heirloom Traditions paint.This will not work with spray paint. I have been looking for a minty color and thought I’d found it…. However when I look at this color on their site it looks more teal. Can you confirm the color? I so want this look and just want to make sure that’s the right color. I know the white wax might calm it down. Thank you! Hi Tif I would say it is more of a Minty color. Synergy is a teal green, although on the site it looks a little different. Beautiful work, thanks for sharing technique! I have never re done furniture. I have a wooden piece about 20 yrs old, not painted. 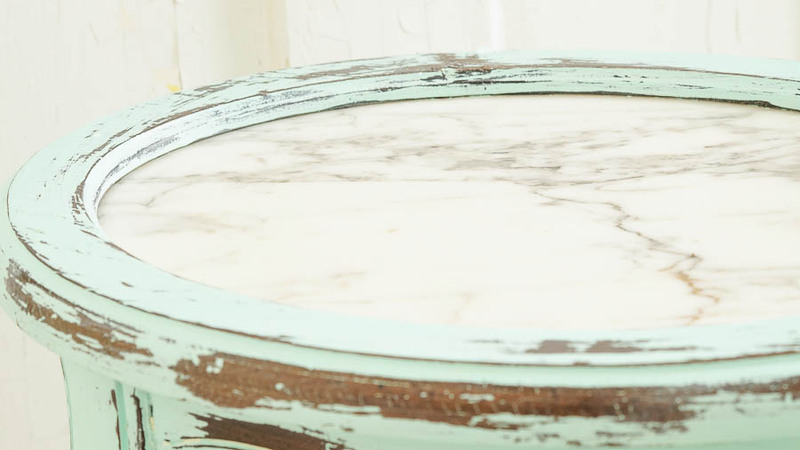 Isn’t sanding required before doing the chalk paint and vinegar? Thanks Carla. I have never sanded before using chalk paint or chalk type paint ( Heirloom Traditions paint). That’s the beauty of using that paint, it sticks to practically every surface. I would always to make sure you clean your piece well before painting. But I never sand first when using chalk paint or chalk type paint. Love this makeover. I was looking for a simple method to makeover my daughter’s dresser. This is already painting in white and I wondering if I just paint another color over the white and use your technic to have blue and white shades? Do you believe of I do this way it will work well. I don’t have a machine to peel all off and pain again. I imagine use spray painting, is it correct? I will waiting for your advice. Thank you advanced. Hello. Id like to use this technique for furniture in the bedroom but I am worried about the odor from the vinegar. Doesn’t it smell quite strongly? Thanks. Yvonne, it’s vinegar, so if you don’t like the smell of vinegar you won’t want to use this technique. I personally don’t mind the smell. I use vinegar to clean most of my home. Beautiful work Anne, and thank you for sharing your distressing technique. I picked up some sample-size and oops paints at HD to mix my own chalk paint. I’ve got everything layed out and ready to go but ARGH!!! I just realized all the paint is the primer/paint mix. Do you think if I work REALLY FAST this paint will work for chalk paint style and vinegar distressing? Thanks so much! this is beautiful and seems so easy to do! You mention you did it with chalk paint. Would this work with latex or oil paint as well? No Virgina this will not work with Latex or Oil paints. I tried this on a piece I did yesterday and it didn’t work. Saying that, I had already clear and dark waxed the piece so maybe that is why? Yep that’s why Donna. This technique will not work on a piece that has been already waxed or sealed with anything. This may be a silly question, but are chalk paint and chalkboard paint the same thing? Would I get the same effect with chalkboard paint? I have a pretty pink I can’t wait to use! i love the scent and taste of vinegar so this will be a pleasure! My question is if I can take a good piece of Century or Henredon furniture in that medium oak color/stain and ASCP directly on it, and then use the vinegar method ? There’s a coffee table & end table that are 25 years + old I’d like to do over. That tired medium to darker wood is boring! Quality furniture but tired, and I’ll sell them if they can’t be repurposed. Can the Vinegar technique work ? What about medium oak cabinets in a bath ? 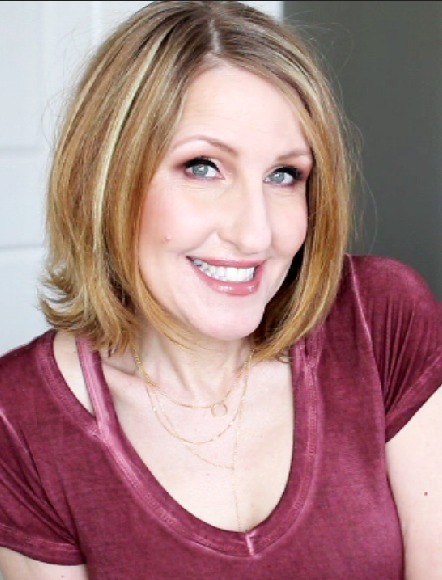 You’re a smart Lady– thank you! Will Apple Cider vinegar work too, or only the white vinegar? Really diggin the vinegar technique! Thanks Nancy, I have not tried Apple Cider Vinegar, only white distilled. LOVE this idea! Thanks for all the comments and learning tidbits. Can’t wait to try this out myself. I am a TOTAL new-be to painting furniture. I LOVE a robin egg blue or duck blue. I get so overwhelmed when trying to chose color. I have two pieces I would like to distress. The first is an armoire given to me, which is an oak stain and the second, a 75 year old door. I am excited to try this method. I was thinking of doing pink on the door and some type of blue on the armoire. What type of chalk paint color do you recommend and brand? I just picked up a table (at the curb), and I want to paint it. I have removed paint before, but have not painted a piece. The table has old paint on it that is partially chipping but largely intact. Should I give it a light sand before painting? Thanks very much. I can’t wait to try your method for distressing, I hope to be able to see the wood and the first coat of paint when finished. Jeanne, yes this method works only when painting with chalk paint. So if you paint chalk paint on top of your already painted piece, the vinegar will help you distress your piece without sanding it. But don’t give it too many coats of paint, if you want to see some of the wood and paint underneath.I would just paint it with one light coat of paint. I just purchased an old solid wood desk and this is exactly the make over I want to give it. Could you give me an idea as to how much paint and wax I should purchase? Hi Susie, this technique only works with Chalk paint. But if you wanted to distress a door that has a red background, but you don’t want to see the red, you will need to paint two different colors. One will be your base the other your top color.Let each coat of paint dry before adding another coat. Once it’s dry,you can distress your door.You can also use a primer over the red door, then add a two different colors on top. This will ensure that you will not see the red door. But if you are using latex paint, you will have to use a sanding block to distress it. I wouldn’t recommend using chalk paint on an outside door, only for an inside door. I love the vintage concept here. Thanks for sharing this post. Thanks so much Tatiana, you’re welcome! How many parts of vinegar to parts of water? Hi Jill, 1/2 water, 1/2 white distilled vinegar. I was just wondering if you could use just Acrylic paint with the water and vinegar as well? Thanks Anne for sharing….I am trying this today on an old piece I found at the second hand store which is goingto be my planting table. After using the vinegar, does it leave a bad smell or not? 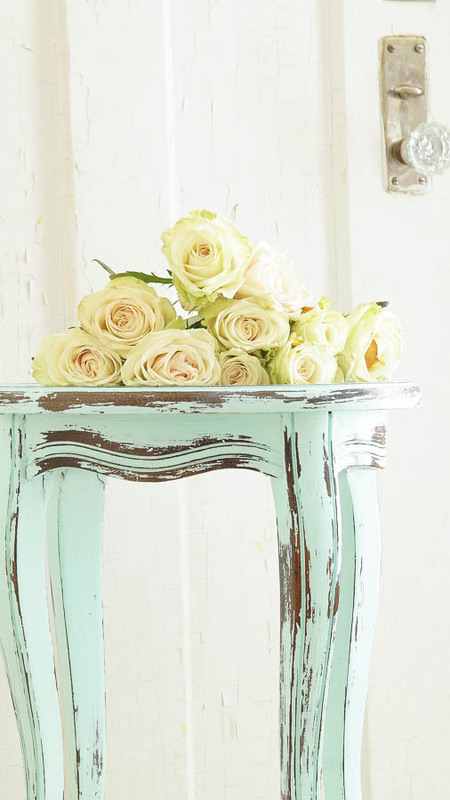 Can you do this method with any paint or does it have to be chalk paint ? 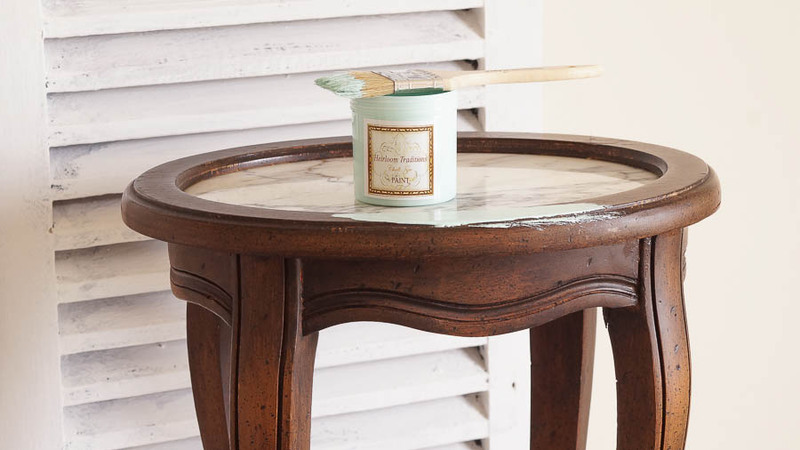 I’m not a fan of chalk paint as I can stand the feel of it …. Oh my gosh, I love this tip! I have used Vaseline and heard of using wax so that the paint comes off easier, but love this! Your table turned out gorgeous! I usually paint with milk paint and have distressed with water and a rag while the paint was not quite dry. 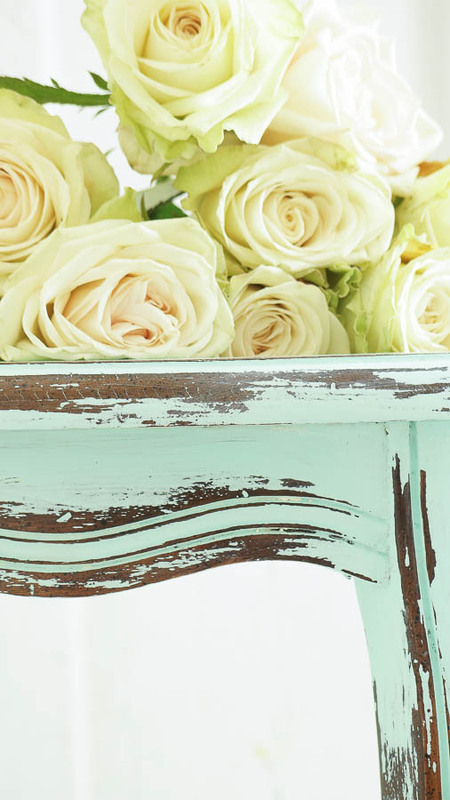 Do you think the vinegar distressing method will work with milk paint? Guess I could just try it and see! I was going to try distressing with vaseline, but this seems easier to control and not as messy. This is my first time to your site and thoroughly enjoyed it. I have chalk painted a couple pieces of furniture. I used Angie Sloan on one piece and not on the other I have waxed both pieces with her light wax and have now decided to paint these pieces with crackle and put another coat of chalk paint over top. Could you please tell me how to take the was off. Can I use a vinegar and water solution to remove it without affecting the original chalk paint. If you do not feel this method would work could you suggest an alternative.. Thank you for any information you may give me. Thanks for sharing your technique, such a great idea! Where did you find the lovely little table? Wow. I would say there are no words, or you have no idea… instead I will tell you how impressed I am with your ideas. I have ordered bedding galore for my guest room. I have plans on refinishing all four pieces of furniture in it. One question … would you wash, chalk, wax and distress this piece? It is a 1945 something or other. Sorry, I realized I forgot to include picture after I sent post. Then there is no way to do so. How can I send you the picture? Describe your vinegar/water solution. Half and half? Does this work with spray paint also? Would this work as well on piece that was painted a long time before? Just came across your post! I have been looking for an alternate way to distress a mantle I am working on! I can’t wait to see how it turns out! Thank you for sharing!!! Just wondering if you can distress with vinegar after wax has been applied to a piece? I also know of another way to distress that’s not messy! I talked with some ladies that do this as a profession and they own a shop. They distress using just regular baby wipes! Works great! I will try the vinegar and water because that would be cheaper. Just wanted to share another way! votre méthode est formidable, je vais essayer de reproduire le même schéma. Vous êtes fantastique. BRAVO C’est trop joli J’ADORE !!!!! When you distress with sandpaper, do you have any preference on what kind you use or the grit? I have table that has been either varnished or stained and protected with polyurethane layer. It has a shiny finish. 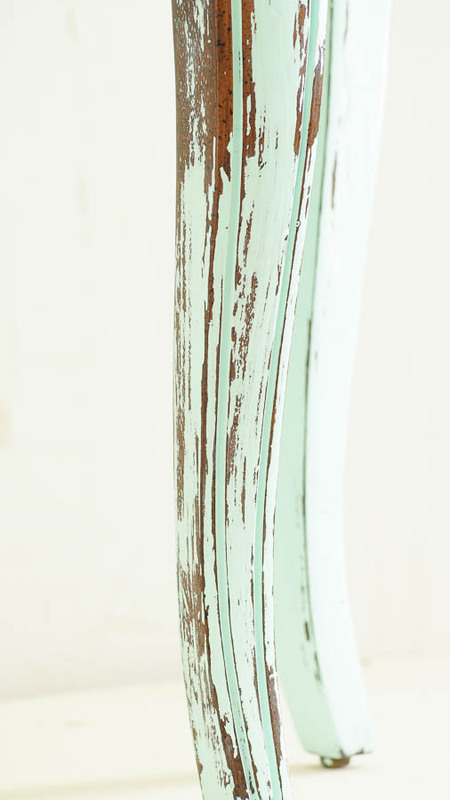 I would like to distress this piece so that it has the same type of finish as your table—stain showing a little behind the chalk paint.. Should I sand the shiny layer off the table before applying the chalk paint? Does this method work on other types of paint as well? Thanks for sharing this tip with us at Family Joy Blog Link Up Party. So glad you joined us. I love the distressed look! Vinegar sounds like a great option! This is definitely a fun and easy way to distress furniture!! On to the chalk paint!! What a beautiful table. I have been wanting to tackle a similar project. I’ll be pinning so I can give it a try! BTW, I’m visiting from Create with Joy. This idea is awesome! And I love that you used mint. First timer to your site. Very cool! I´ve loved your idea and i´ve subscrived your blog, but now i can´t download the pfd. I don´t know what is happening, but it just don´t make the download. Anne, I can’t wait to try this technique. Tomorrow I’m going to pick up a table from a little shop where they chalk paint and wax furniture. The piece is NOT a color I am interested in. So I was thinking of repainting it, but it would look good with a some distressing. I hope the wax doesn’t give my problems. Have you dealt with painting waxed furniture? Any tips? I have some Sherwin paint in the perfect color, maybe paint that instead of chalk… wonder if the vinegar would still work? Did I miss something… should the paint dry completely first before using the vinegar? I got the same result when I painted a small bookshelf with oil paint and the painted over it with water based paint. A very cool distressed look, completely by accident. But vinegar is a great idea and will definitely try it. 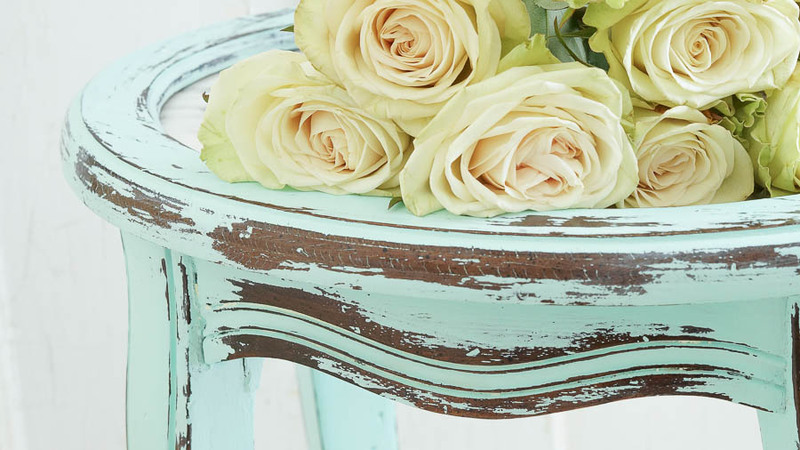 I’ve also seen a blog where you can make chalk paint simply by adding baking soda. Good lan if you are painting a waxed piece.